Lobo and his sidekick raven find a trail camera in their neck of the woods, and it attracts the attention of forest friends. Images captured have never been sillier or more candid. Just as their wild dispositions are exposed, the photo shoot comes to an unexpected end and they're all left wondering why. The reason may be obvious. 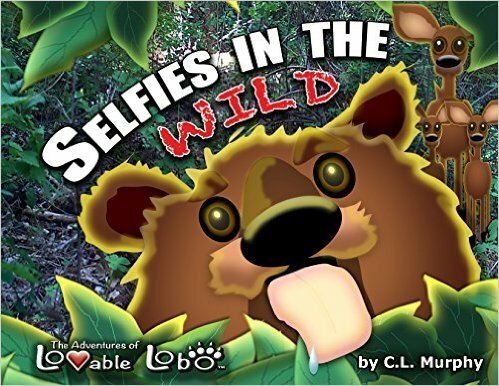 Selfies in the Wild is a TOTALLY FUN BOOK! Lobo, the wolf pup, and his buddies discover a trail camera, and when they realize that the trail cam captures pictures of them (without actually “capturing” them), they come up with some hilarious star-studded poses that are wonderfully illustrated. There’s lots of clever words too; in Lobo’s world the characters are glutton-free and have feet that are pawsitively stinky. As the characters in this book state: “Let’s make a good impression”, that is certainly what C.L. Murphy did by writing and illustrating this book. C.L. Murphy’s book are always fantastic, and Selfies in the Wild is the latest book in the author’s string of well written and delightful illustrated books. The author has an incredible imaginative way with words and art that captures the hearts of children and adults alike. This book had me chuckling throughout. Lobo and friends always make life an adventure–I love that about these books.